Annelies Marie Frank , born 12 June 1929 in Frankfurt am Main – February 1945 in Bergen-Belsen) is one of the most famous Jewish people who died in the Holocaust. Her diary is seen as a classic in war literature, and is one of the most widely read books today. Several plays and movies have been made about it. Anne was born in the city Frankfurt am Main in Weimar Germany. She lived most of her life in or around Amsterdam, in the Netherlands. She was officially seen as a German until 1941. This was when she lost her nationality because of the anti-Semitic rules of Nazi Germany. She became famous around the world after her death when her diary was printed. In it she described her experiences hiding during the Nazi German occupation of the Netherlands in World War II. The Frank family moved from Germany to Holland's capital, Amsterdam in 1933. This was the same year that the Nazis grew powerful in Germany. By the beginning of 1940, because of the Nazi occupation of the Netherlands, the Frank family was trapped in Amsterdam. Persecution of Jewish people increased in July 1942, and the family decided to hide. They hid in some secret rooms of her father Otto Frank's office building. After two years, they were betrayed and taken to concentration camps. Anne and her sister, Margot, were later taken to the Bergen-Belsen concentration camp. There, they both died from typhus in February 1945. Otto Frank was the only person in his family who survived. He went back to Amsterdam after the war and found that Anne's diary had been saved. He helped print a version of it in 1947. It was translated from Dutch and first printed in English in 1952 as The Diary of a Young Girl. It has been translated into many languages. The diary had been given to Anne on her 13th birthday. In it she wrote of her life from 12 June 1942 until 1 August 1944. she was only 15 years old when she died. Anne Frank was born on 12 June 1929 in Frankfurt, Germany. She was the second daughter of Otto Frank (1889–1980), a German businessman, and Edith Frank-Holländer (1900 – 45). Margot Frank (1926–45) was her older sister. The Franks were Jews, and they lived with many Jewish and non-Jewish citizens. Anne and Margot grew up with Catholic, Protestant, and Jewish friends. The Frank family did not follow all the customs of Judaism. Edith Frank was very religious, though her husband was more interested in studying. He had a large library, and both parents encouraged the children to read. On 13 March 1933, elections were held in Frankfurt, and Adolf Hitler's Nazi Party won. Acts of Antisemitism began almost immediately. The Franks were afraid of what might happen to them if they stayed in Germany. Therefore, later that year, Edith and the children went to Aachen. They stayed there with Edith's mother, Rosa Holländer. Otto remained in Frankfurt, but after getting an offer to start a company in Amsterdam, he moved there to begin the business and to find a place to live with his family. The Franks were included in the 300,000 Jews who ran away from Germany between 1933 and 1939. Otto Frank began working at the Opekta Works. Opteka was a company that sold pectin. 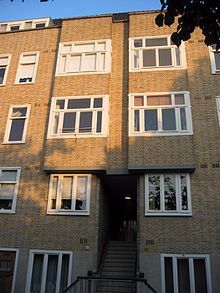 Otto Frank found an apartment on the Merwedeplein (Merwede Square) in Amsterdam. By February 1934, Edith and the children had arrived in Amsterdam, and Anne and Margot began going to school. Margot went to public school and Anne went to a Montessori school. Margot enjoyed math, while Anne preferred reading and writing. Her friend Hanneli Goslar later remembered that from when she was young, Anne often wrote, though she tried to hide what she wrote and did not like talking about it. Margot and Anne had very different personalities. Margot was polite, quiet, and thoughtful, while Anne was brave, energetic, and friendly. In 1938, Otto Frank started a second company, Pectacon. Pectacon sold herbs, salts and mixed spices that were used to make sausages. Hermann van Pels worked at Pectacon as a helper about spices. He was a Jewish butcher. In 1939, Edith's mother came to live with the Franks. She stayed with them until she died in January 1942. In May 1940, Germany invaded the Netherlands. The government began to hurt Jews by making rules and laws about their freedom. The Frank sisters were both studying well and had many friends. But a new law that Jewish children could only go to a Jewish school made them move to a Jewish school. The companies that Otto Frank worked at still gave him some money, but they became poorer. It was not enough to support their family. For her 13th birthday on 12 June 1942, Anne Frank got a book she had shown her father a few days before. It was actually an autograph book with red-and-white cloth and a small lock on the front, but Anne decided to use it as a diary. She began writing in it almost immediately. Most of her first writings are about normal parts of her life, but she also wrote about some other things. In July 1942, the Zentralstelle für jüdische Auswanderung (Central Office for Jewish Emigration) ordered Margot Frank to come to be taken to a work camp. Otto Frank told his family that they would hide in rooms above and behind the place where his company worked on the Prinsengracht. The Prinsengracht was a street next to one of Amsterdam's canals, where some of his most trusted employees would help them. The notice to Margot made them move a few weeks earlier than they had expected. Anne's father, Otto Frank, was scared that the Nazis would find him, and his family. He wanted to protect his family. He spoke to some of the people who worked in his business. One of them was a young woman of about 33 years old, and was named Miep Gies. Otto Frank needed help - he was going to turn the top floor of his business into a secret hiding place for himself and his family called "The Secret Annex". Miep and the others would have to help them keep their secret, and bring them food. They hid in their secret hiding place for two whole years, without being discovered by the Nazis. Anne Frank left all her other belongings in Frankfurt. Miep agreed to help. In 1942, the Frank family, together with the Van Pels (And their son Peter) and a dentist named Fritz Pfeffer, moved into the Secret Annex that they had prepared. They planned to stay there until the end of the war. They hoped the war would end soon, but it did not. They spent around two and a half years in their hiding place, never able to go out into the sunshine. During the day, the family had to be very quiet, because the business continued downstairs, and not all the workers knew that the Frank family was in hiding in the upper part of the building. A few months before the Franks went into hiding, Anne was given a diary, for her birthday. She called her diary "Kitty" and wrote in it about all the things that were happening to her and to her family. Anne was only a young girl, but she knew how to write beautifully. She wrote about all the things that young girls think about - how she was getting along with her friends and parents, boys (pretty much Peter), her life and emotions. After a while, Anne had a strong ambition: to be a writer. She hoped to write a book that everyone would read. A total of 78 families lived hiding in the same building which was a total of 700 people. After 2 years a thief had come and took not much, but after about two and a half years in hiding, not long before the end of the war, the thief was caught and, in exchange of not going to jail or death, he told the Nazis that a Jewish family - the Franks - were in hiding. Nazi soldiers came into the Frank's secret hiding place. They sent the Franks and the others to a concentration camp. Miep Gies found Anne's diary and put it into a drawer. She wanted to keep it safe until after the war. She hoped that Anne would return, and she would be able give her her diary back to her. However, that was not to be. Anne's father, Otto Frank, lived through the war and came back to Amsterdam. He hoped that his family had survived too - but they had not. Of all the family, only he survived. His wife was killed at Auschwitz. Anne and her older sister, Margot, died at Bergen-Belsen concentration camp from typhus, a disease - only a month before the camp was freed by the Allied forces. When he got out, he found Anne's diary and published it. 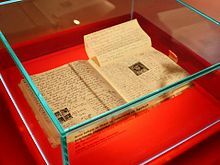 A copy of the diary of Anne Frank on display at the Anne Frank Zentrum in Berlin, Germany. When World War II ended, Miep Gies gave Otto Frank Anne's diary and a bundle of notes. Otto Frank then decided to publish her diary to commemorate her. Miep Gies was with Otto Frank when he got the letter telling him that his two daughters were dead. Now she knew that Anne would never return for her diary. She went to the drawer where the diary was kept, and she gave it to Otto Frank. People who were close to Anne read the diary. They told Otto Frank that he should publish it. Anne had wanted to be a famous writer. Now, people would be able to read her book, and they would also learn about the difficult time that the Jews had during the war, and about the wonderful people who helped them. Otto had Anne's diary printed. It became one of the world's most widely-read books. It has been printed in over 20 languages, and people across the world have read and enjoyed this true story. Today, for an admissions fee, you can visit the house in Amsterdam where Anne Frank and her family hid during the war. You can also see the diary that she wrote. ↑ 3.0 3.1 "Encyclopædia Britannica's Reflections on the Holocaust". britannica.com. Retrieved 23 June 2010. Frank, Anne (1995) . Frank, Otto H.; Pressler, Mirjam, eds. Het Achterhuis [The Diary of a Young Girl - The Definitive Edition] (in Dutch). Massotty, Susan (translation). Doubleday. ISBN 0-553-29698-1. ; This edition, a new translation, includes material excluded from the earlier edition. Lee, Carol Ann (2000). The Biography of Anne Frank - Roses from the Earth. Viking Press. ISBN 0-7089-9174-2. Müller, Melissa (1999) . Das Mädchen Anne Frank [Anne Frank: The Biography] (in German). Kimber, Rita and Robert (translators). Henry Holt and Company. ISBN 0-7475-4523-5. OCLC 42369449. ; With a note from Miep Gies. van der Rol, Ruud; Verhoeven, Rian (for the Anne Frank House); Quindlen, Anna (Introduction); Langham, Tony & Peters, Plym (translation) (1995). Anne Frank - Beyond the Diary - A Photographic Remembrance. Puffin. ISBN 0-14-036926-0. "Anne Frank Museum Amsterdam - the official Anne Frank House website". annefrank.org. Retrieved 18 June 2010. "Anne Frank-Fonds". annefrank.ch. Retrieved 18 June 2010. This page was last changed on 1 April 2019, at 13:59.